Looking like something out of a Walt Disney fairytale, Glamis Castle was originally a 14th century keep which has been extended extensively over the years. It is the sort of Castle which really does look as though it should be haunted and according to many reports it most definitely is. The castle is the family seat of the Earl of Strathmore and Kinghorn dating back to the 15th century. The great playwright William Shakespeare set part of Macbeth or to be more accurate the murder of King Duncan within this castle's walls but today Glamis Castle is probably best known as the family seat of the Bowes Lyons, and the home of the late Queen Elizabeth the Queen Mother. By all accounts, the castle is haunted by more than one ghost. At various times both the Grey Lady and the White Lady have made themselves known to the occupants. Although no one really has much idea of her identity, the Grey Lady is most frequently seen in the area of the chapel. The White Lady, who is only seen occasionally, is believed to be the ghost of Janet Douglas who in the 16th century was married to John, sixth Lord Glamis. She is said to have married Archibald Campbell after the death of her husband and brought him to live at Glamis Castle but eventually because of a long-standing hatred of the Douglas family by King James the fifth who very much resented her and her beauty, she was imprisoned by the King for many years in Edinburgh Castle on fabricated charges of conspiracy to poison the King and of witchcraft and in an act which can only be described as spiteful, she was burnt at the stake on Castle Hill. Her husband also died in his case, attempting to flee from the castle and even her son Lord Glamis was held prisoner until after the death of James the fifth. Apparently he was a gambling man who had a very quick and violent temper. It is said that on a certain Saturday night he could find no one who would play cards with him late into the night as the sabbath day approached and so he exclaimed that he would quite happily play with the devil himself if challenged to do so. The legend goes on that a dark stranger appeared and offered to play cards with him and so the two retired to the chamber to begin play. Apparently soon servants in the castle were roused by the noise of swearing and shouting and all manner of vile exclamations coming from the room which made it plain that Beardie was losing disastrously. A servant is supposed to have looked through the keyhole only to be blinded by a dart of flame which shot into his eye. His screams caused Beardie to emerge from the chamber ranting and raging at the interruption but when he returned to continue his game he found that the dark stranger had disappeared. The legend says that the devil had gone and taken Beardie's soul with him which Beardie had unwisely gambled away. After Beardie's death, that room was sealed up but all manner of terrible swearing and curses could still be heard coming from the room and the ghost of Beardie with its long straggly beard is said to appear in various parts of the castle. 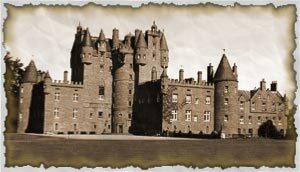 One unusual ghostly claim to fame attributed to Glamis Castle is that it is supposed to have the first black ghost in Scotland haunting within. The ghost concerned is supposed to be the spirit of a much abused servant boy who can sometimes be seen upon a stone seat outside the Queen mothers sitting room. He is supposed to have been ordered to sit there and not move from the spot but his Masters forgot about him and he was left there overnight until apparently he froze to death.